With directory synchronization, you can continue to manage users and groups on-premises and synchronize additions, deletions, and changes to the cloud. But setup is a little complicated and it can sometimes be difficult to identify the source of problems. We have resources to help you identify potential issues and fix them. How do I know if something is wrong? You will also receive a mail (to the alternate email and to your admin email) from Office 365 that indicates your tenant has encountered directory synchronization errors. For details see Identify directory synchronization errors in Office 365. How do I get Azure Active Directory Connect tool? In the Microsoft 365 admin center, navigate to ** Users ** > Active users. Click the More menu and select Directory synchronization. Follow the instructions in the wizard to download Azure AD Connect. 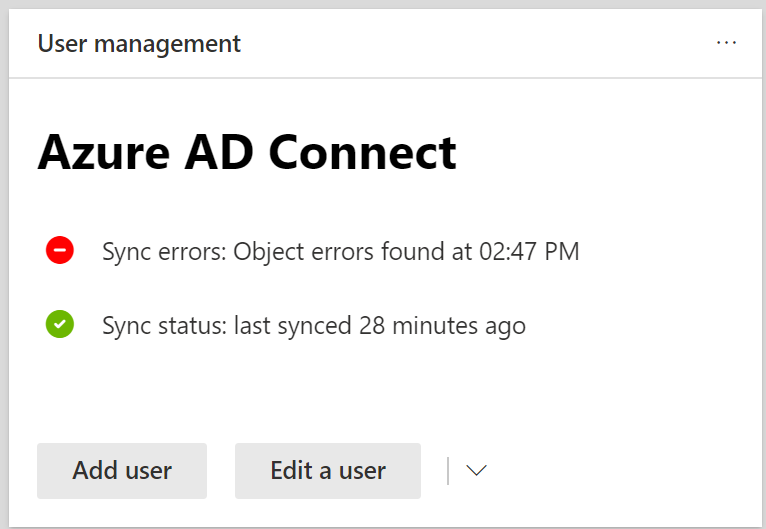 If you are still using Azure Active Directory Sync (DirSync), take a look at How to troubleshoot Azure Active Directory Sync Tool installation and Configuration Wizard error messages in Office 365 for information about the system requirements to install dirsync, the permissions you need, and how to troubleshoot common errors. 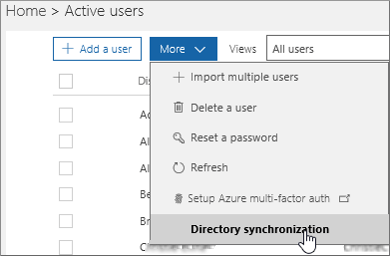 To update from Azure Active Directory Sync to Azure AD Connect, see the upgrade instructions. Synchronized objects aren't appearing or updating online, or I'm getting synchronization error reports from the Service. We have a built-in object quota to help protect the service. If you have too many objects in your directory that need to sync to Office 365, you'll have to Contact support for business products to increase your quota. You can find a list of all the attributes that are synced between on-premises and the cloud right here. Are you ready to manage objects in the cloud only? Or is there an object that was deleted on-premises, but is stuck in the cloud? Take a look at this Troubleshooting Errors during synchronization and support article for guidance on how to resolve these issues. IDFix tool is used to perform discovery and remediation of identity objects and their attributes in an on-premises Active Directory environment in preparation for migration to Office 365. IDFix is intended for the Active Directory administrators responsible for DirSync with the Office 365 service. Download the IDFix tool from the Microsoft download center.